Then you see another such mound. And then another. Head up to the central observation deck and you’ll see hundreds more. (There are supposedly 1,776 in total). Some are 50 meters high. The largest towers 120 meters above the flat jungle floor. What sort of phenomena could have made these mounds? Geologists have, in fact, been arguing over that very question. Spot Cool Stuff favors the hypothesis that the hills are ancient coral reefs pushed up into their conical shape when the island of Bohol was created. 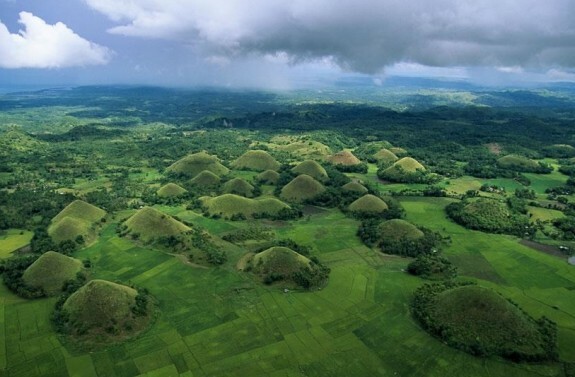 Other theories maintain that volcanic activity or tidal movements created the Chocolate Hills. A few still believe that the hills were made by man long ago, the last remains of a lost culture. And then there’s the legend that tells of two giants who got into a stone-throwing fight—the mounds are the stones they left behind. 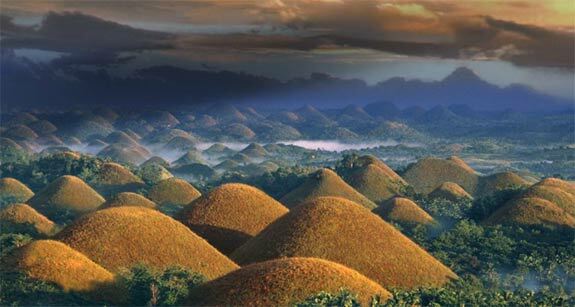 No matter how they were created the vista the Chocolate Hills provide today are spectacular, especially in late August when the grass withers and turns a chocolate brown (hence the name). The photos below give a sense of it but, really, there are certain sights that look better in photographs (we always thought Stonehenge was one of these) and certain sights that must be seen in person to be appreciated. 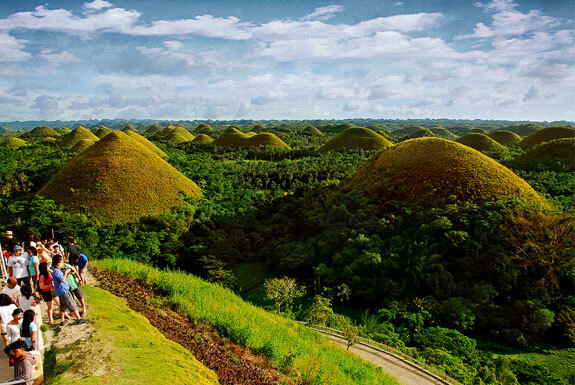 The Chocolate Hills falls in the latter group. Even if you have to bring your own chocolate. Getting there: Cebu City is a major hub for domestic (and some international flights). From there frequent ferries make the journey across the Cebu Straight to Bohol Island. The busiest ferry port on Bohol is Tagbilaran from where it is easy to book a Chocolate Hills tour or take a bus to Carmen and explore yourself. Any decent guidebook will have details. Where to stay: The only place to stay within the hills is the government run resort Chocolate Hills Complex; it has been under renovation for at least four years and still appears to be at the time of writing. Elsewhere on the island there are several mid-range resorts, our favorite of which is the The Peacock Garden Luxury Resort and Spa. For budget travelers, we suggest the Alumbung Resort, which is technically on Panglao Island, a stone’s throw from Bohol’s southeast coast. 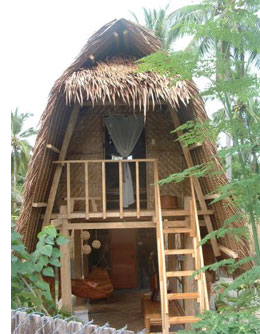 Rent a traditional beach hut (see photo to the right) for $15 — hammock included! 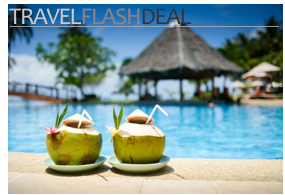 Click here for budget options on Bohol proper. If you go: Bohol was the epicenter of an earthquake in 2013. Before you count on staying somewhere (other than our above suggestions) confirm that it’s still in business. 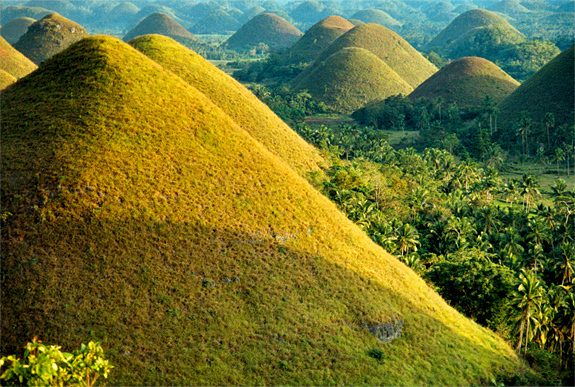 You can also check out the mini chocolate hills in Zamboanguita if you can’t afford to get to Bohol! You can find this place in Bohol, a province in the Philippines. Specifically, it’s located in Buenos Aires, Carmen. I should know, I was born in the foot of one of these hills. That looks awesome. I think I saw something like this in Scotland, only smaller. Where do you find this amazing stuff? Looks like a decor from a Spielberg movie.